Rottweilers are one of the original herding dogs. The breed has a long history that dates back to the Roman Empire. They were typically used as working dogs. They helped herd livestock and even pull carts for butchers. Today, Rottweilers are lovable creatures that make an excellent addition to the family. While they do have a somewhat sordid reputation due to their sheer size and muscular build, a well-trained Rottweiler is friendly, loyal, and affectionate. To keep these dogs healthy, you're going to need to provide them with a healthy diet that fits their nutritional needs. They demand plenty of fuel to stay healthy. Not only that, but their build puts them at risk for a couple of different health issues. Here is some information that can help you find the perfect kibble for your Rottweiler. How Much Food Does a Rottweiler Need? Rottweilers, also affectionately known as Rotties, are large creatures. Males can weigh upwards of 130 pounds when they're fully grown while females can weigh up to 105 pounds. They're also very active. They have no problem running around a farm and getting plenty of exercises. As a result, they have a very muscular build. Working dogs can have well-defined muscles. To keep their bodies in check Rotties need a lot of calories every day. When you're planning your dog's diet, it's important to keep an eye on their lifestyle and body condition. A dog's needs will change throughout their life. The amount of food you give your dog as a young adult should not be the same amount that you give them when they're a senior. There's no exact science to figuring out how much food your pooch needs. There are only guidelines to help you get a better idea of where to start. You need to consider how much exercise they get, the nutritional density of the dog you provide, and whether or not your furry friend needs to gain or lose weight. The amount of food you provide should be measured in calories rather than volume. Most manufacturers provide plenty of calorie information on the packaging so that you can divide means appropriately. Generally, the average healthy adult dog will need around 2,200 calories every single day. If your dog likes to exercise a lot, you may want to bump that amount by a couple of hundred calories. For dogs that spend the entire day exercising, you're going to need to provide as much as 3,500 calories. This is typically reserved for working dogs that need as much fuel as they can get. As dogs get older, they typically start to slow down a bit. They may spend less time exercising and more time lounging around the house. When this happens, you need to adjust their diet to avoid any unnecessary weight gain. Most senior dogs will need about 1,800 calories a day. This may also be the case for adult dogs that lose their energy after being fixed. 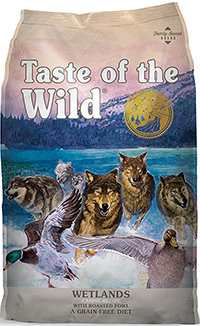 This kibble from Taste of the Wild is great for Rotties. Duck is the first ingredient listed. It also has duck meal, chicken meal, roasted duck, and roasted quail. All of these high-quality protein sources make up 32 percent of the formula. The meats are accompanied by great carbohydrates like sweet potatoes and peas. There's also tomatoes, raspberries, and blueberries. These plant-based ingredients provide antioxidants and vitamins. The use of ocean fish meal also adds omega fatty acids. Overall, this dry dog food can provide your Rottweiler with a balanced diet filled with beneficial ingredients they can use to thrive. 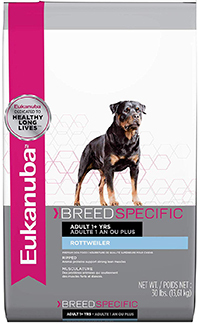 From Eukanuba is this breed-specific formula. It's designed to meet the unique needs of Rottweilers. It's made up of 25 percent protein and 13 percent fat. The protein comes from chicken and chicken meal. The meal also adds a much-needed dose of glucosamine and chondroitin. The addition of fish meal also does double duty. It helps to increase the protein content while giving your dog essential omega fatty acids. Some of the other beneficial ingredients include whole grain barley, dried beet pulp, and plenty of supplementary vitamins. The food also has Eukanuba's Dentadefense system. It helps to reduce tartar buildup on the teeth. 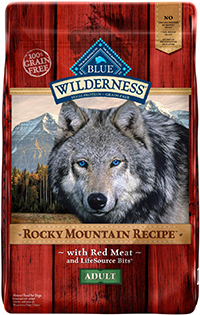 If you're looking for a dog food with a lot of vitamins and antioxidants, this formula from Blue Wilderness may be for you. It contains the manufacturer's signature Life Source Bits. These tiny morsels are made with plant-based ingredients like dried kelp, blueberries, cranberries, and parsley. They're chock-full of vitamins, minerals, and antioxidants to support your pup's immune system. When it comes to protein, this kibble doesn't disappoint. It's made up of 30 percent protein. This high percentage comes from deboned beef, chicken meal, and fish meal. 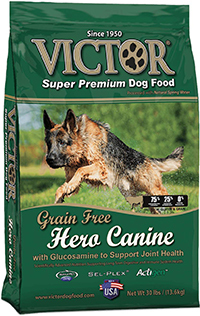 This dog food from Victor has very high protein content. In total, 33 percent of the formula is made of protein. You'll find ingredients like beef meal, chicken meal, pork meal, and fish meal. 75 percent of the protein ingredients are sourced from the United States. Some other notable ingredients include sweet potatoes as complex carbohydrates and flaxseed for omega fatty acids. There's also a lot of supplements included. When your dog eats this food, they're getting glucosamine, chondroitin, vitamin B-12, zinc, and so much more. 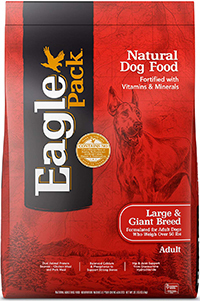 Made for large and giant breeds, this kibble from Eagle Pack is a great option for Rottweilers. It contains all natural ingredients and is free of any potentially harmful fillers like corn, wheat, or soy. About 25 percent of the recipe is made up of protein. The main protein sources are chicken meal and protein meal. It also has ground brown rice, oatmeal, and flaxseed. These beneficial ingredients are used as carbohydrates. They also help to give your dog plenty of fiber to keep their gastrointestinal systems healthy. How Often Should You Feed a Rottweiler? Many dog owners choose to let their pups decide when they're going to eat. This method, known as free-feeding, involves leaving a constant supply of food out. It's recommended that you don't utilize this method for Rottweilers. Rotties are voracious eaters. They love food and will eat just about anything you put in front of them. As a result, they're very susceptible to weight gain. Not only that, but eating too much food can result in potentially fatal bloat. To ensure that your dog doesn't indulge too much, you need to split up their daily calorie requirements into at least two meals. Your Rottweiler will do just fine with one meal in the morning and one meal in the evening. If you're taking care of a puppy, you can split food up into three or four meals. However, it's recommended that you slowly transition to two meals as they reach adulthood. What Makes a Good Dog Food for Rottweilers? With their large size and muscular build, Rottweilers need a high-quality dry kibble. Substandard foods just won't do. To keep your dog healthy, you're going to need to keep their muscles in prime condition. Here's a rundown of some of the things you should look for when you're shopping for dog food. Protein is the most important ingredient. This is true for all dogs regardless of breed. However, Rottweilers need much more of it than other dogs. It's recommended that you go with a kibble that's made up of around 28 percent protein. Many dogs will benefit from foods with 30 percent protein or higher. . Protein is the building blocks of your dog's muscles. They contain amino acids that help to develop the muscles and keep them healthy. Because of their high activity levels, Rotties need as much protein as they can get. High-quality sources like whole animal meat are best. Meat meals are also acceptable. They're simply ground up animal meats. As long as you can identify the particular animal that the meal came from, it's a good option for your pup. It's best to avoid mystery meats and animal byproducts. These protein sources are often found in cheaper foods. They don't have the complex amino acid profiles as pure animal meat does. Not only that, but byproducts sometimes come from questionable sources. 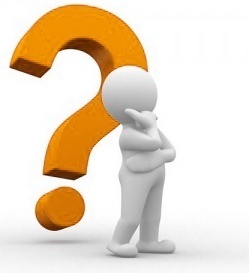 Who knows what types of chemicals or diseases those ingredients are carrying. Carbohydrates, while not always necessary to a canine's diet, are found in every commercially available dog kibble. They help to keep the healthy ingredients together and make your dog feel full. It's important that you go with foods that utilize complex carbohydrates. These include ingredients like sweet potatoes, beans, brown rice, and more. Complex carbs are absorbed into the body slowly. This helps to regulate blood sugar while giving your pup lasting energy throughout the day. Simple carbs should be avoided. Ingredients like corn, wheat, or soy are absorbed very quickly. They give your dog a quick boost of energy that depletes halfway through the day. Because they are absorbed faster, they can also put your dog's blood sugar in a dangerous place. If not controlled, this can lead to diabetes. On top of all of that, many dogs don't handle simple carbohydrates that well. They're simply not built to digest corn, wheat, or soy. They can experience gastrointestinal upsets. While most people go out of their way to avoid fat, dogs need a healthy dose of fat to stay healthy. It adds a ton of great flavor and gives your dog a much-needed boost of energy. Rotties should have a diet that consists of approximately 12 to 16 percent fat. Ideally, the fat should come from the animal protein source. Avoid anything listed as simply "animal fat." If there's additional fat added to the recipe, make sure that the animal it comes from is clearly identified. Alternatively, you can find a formula that contains salmon or flaxseed oil. These oils contain omega fatty acids. They help to improve cardiovascular health. Furthermore, they can keep your Rottie's coat soft and supple. Vitamins are essential for proper cell function. Your dog can get their daily dose of vitamins with fruits and vegetables. Many dog food manufacturers add ingredients like carrots, kale, spinach, and apples. All of these ingredients provide essential vitamins your dog needs to thrive. Some fruits and vegetables also contain antioxidants. Antioxidants help to protect your pup's cells from potentially harmful free radicals. This can help to strengthen their immune system and keep them healthy. Minerals can also be found in many fruits and vegetables. They help to keep the bones and organs healthy. Some important minerals your Rottweiler will need are calcium and phosphorous. They play an important role in overall bone development and strength. A healthy dosage of minerals can keep the bones and joints in check. Luckily, Rottweilers are a generally healthy breed. 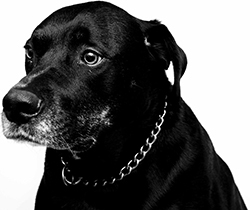 They aren't susceptible to a lot of health conditions like other dogs their size. However, that doesn't mean that they're immune. There are a couple of health issues you should be aware of. Many of these conditions can be avoided or treated with a proper diet. 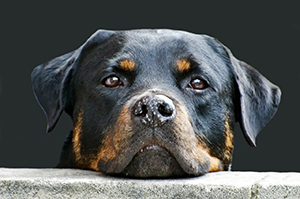 This issue can affect Rottweilers as they get older. It affects the shoulder joints. The cartilage in the joints can become damaged. This leads to pain and limited movement. The reason that Rotties are susceptible to Osteochondritis Dissecans is that they grow up quite fast. To help your puppy avoid this problem, you need to provide them with a healthy diet from day one. It's important to keep their diet in check and avoid weight gain during their developmental stages. 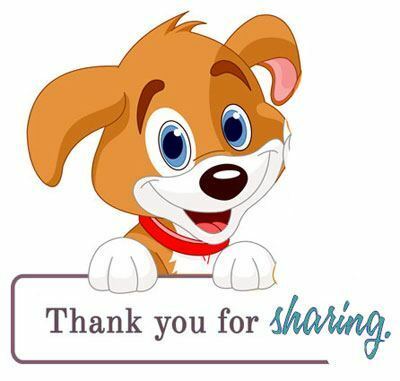 Hip Dysplasia is not a breed-specific problem. It affects many larger dogs. The hip joints can become malformed. This results in lameness and pain in the hind legs. The best way to avoid this condition is to prevent your dog from gaining weight. You can also get a dog food with glucosamine and chondroitin. These supplements help to keep the joints healthy. Another issue that plagues larger dogs is bloat. While a bit of excess gas may not seem that harmful, it can be fatal. When bloat occurs, the stomach twists. This prevents air from escaping. To avoid bloat, you need to ensure that your dog doesn't eat a lot of food in a short period of time. Split their meals up and avoid any exercise for at least 30 minutes after eating. If your dog likes to gobble up their food in a few minutes, you can try bowl inserts that are designed to slow your dog down and prevent bloat. Many Rottweilers experience cancer at some point in their lives. While there's no way to prevent cancer there are things you can do to decrease your dog's chances of suffering from it. A healthy diet filled with vitamins and minerals are important. It's also a good idea to incorporate antioxidants to keep the cells healthy.